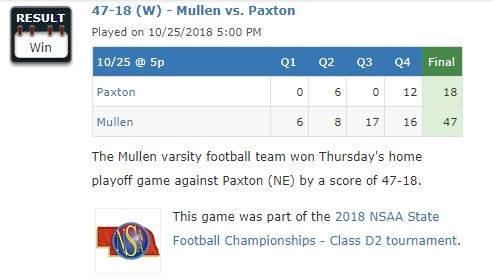 Mullen Broncos defeated Paxton 47-18 on Thursday, October 25 in round 1 of the 2018 NSAA State Football Championships – Class D2 tournament. 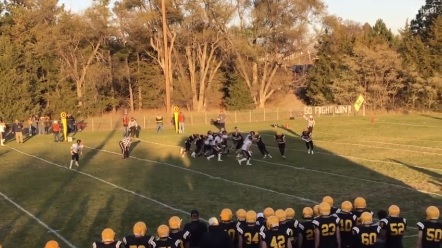 Garden County won their game 50-8 over Medicine Valley so Mullen will host game 2 of the playoffs on October 31st at 7 pm CT. Catch all the action on Heart City Radio! Congratulations to Sandhills/Thedford as they defeated Bertrand 48-26. They will face Overton at 7 pm on 10/31. North Central advanced as well, defeating Neligh-Oakdale 60-26 in D1 action. North Central will take on Nebraska Christian at 7 pm on 10/31.